The QDHP is an organisation developed by doctors, led by doctors that was established as a service arm of the Doctors’ Health Advisory Service Qld (DHASQ). 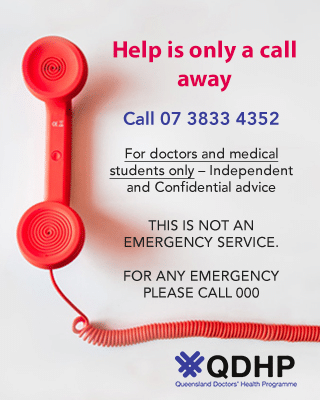 Our organisation has received dedicated support from doctors who, on a voluntary basis, answer our helpline and provide assistance to colleagues who have concerns and may be in difficulty. QDHP recognises that medical practitioners may find it challenging accepting the role as a patient and many fail to seek help in a timely manner. Yet doctors experience the same wide range of health-related issues as others in the community, as well as conditions specifically related to the stresses of professional practice. QDHP is dedicated to improving the health and wellbeing of doctors and medical students in Queensland, understanding that this work benefits the community as a whole – improving the delivery of quality care and encouraging others to focus on positive health maintenance behaviours.